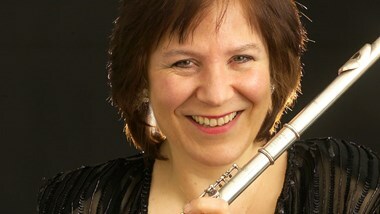 This course offers flautists an opportunity to improve their flute playing with daily sound and technique workshops, rehearsal opportunities with an experienced accompanist, masterclasses and flute choir ensemble playing. Each day will start with a sound session to improve all aspects of tone production followed by sessions studying techniques such as articulation, posture, breathing, phrasing, vibrato, tuning, dynamics and any specific aspects of technique that you wish specific help with, running parallel with independent accompaniment sessions with an accompanist. The afternoon sessions will be divided between ensemble playing and an open masterclass with the group. Playing in the masterclass is voluntary and the objective of these sessions is to provide a supportive atmosphere to play and discuss technique and interpretation of your chosen repertoire that will be of benefit to both listeners and performers. The evening session will be a chance to relax and enjoy playing together various arrangements from ballet, film and classical genres giving you the opportunity to work on ensemble skills such as tuning, leading, stagecraft and balance, through the enjoyment of ensemble playing, and guide you as to how to rehearse in such groups. Please let us know in advance whether you will be bringing along a piccolo, alto or bass flute to the flute choir sessions so we may plan appropriate repertoire for the ensemble sessions, along with your approximate playing standard. There will be an optional sharing at the end of the course at 2.30pm on the last day, where participants may perform, to friends and family, their solo repertoire from the masterclasses and ensemble repertoire worked on throughout the course.